Want to make a six figure income? While wealth and work from home are often promoted together, income from home-based careers varies greatly. Like it’s traditional world counterparts, working at home doesn’t usually pay in riches. With that said, it is possible to earn a six-figure income from home. 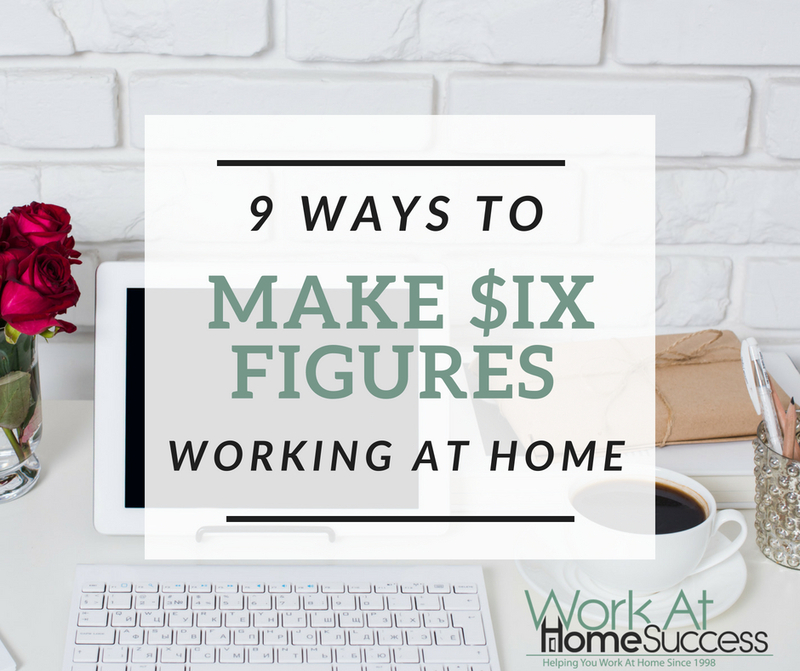 Here is a list of ways to make money working at home that have the potential to pay six-figure incomes. Some require specific education or training, and experience. Others, don’t require anything but effort on your part. Note that these jobs don’t automatically pay six-figures, but instead have the potential to earn well. Like any other type of work, what you earn will depend a lot on you and what you have to offer an employer or how well you market yourself. The jobs below are organized into different categories such as finance and writing. Read about starting a coaching or consulting business. Whether it’s eBay, Etsy, Amazon or some other storefront, if you have a great product and can find your market, you can do well in online marketplaces. What you can sell is vast, as long as it’s legal and doesn’t violate the terms of service of the storefront service. If you’re serious about a six-figure income selling through Amazon Fulfillment, I recommend you check out Jessica Larrew’s program at The Selling Family. If you have the skills and education to deal with numbers and money, there are many work-at-home jobs or home businesses you can start that can pay well. In some cases, such as loan manager, you may not necessarily need a degree in accounting, but you’ll likely need experience in selling loans. These types of jobs can be found on job sites or FlexJobs. There are many health-related jobs you can do from home. You can find many on Careerbuilder or through FlexJobs. The six-figure jobs often are in management or director roles. The ability to persuade people to part with their money continues to be one of the more lucrative ways to make money at home. Along with copywriting, the following work-at-home jobs offer the the ability to make a six-figure income. I find these jobs in a variety of places including Indeed Jobs, FlexJobs, HomeJobStop, and Careerbuilder. Direct Sales – Networking marketing is a great way to build a six-figure income part-time from home. But you need to do your due-diligence in researching companies, not just to make sure they’re legit, but also that you can enthusiastically promote its products/services, and business plan. Check out WAHS University’s course for tips and step-by-step instruction on Direct Sales Success. Non-profits, by their very name, aren’t about big bucks, but there are a few job that have the potential to earn six-figures. These jobs can be found on FlexJobs and sometimes Indeed Jobs and Careerbuilder. Like marketing and sales, technical knowledge and know-how continues to be highly needed and rewarded. The good news is that often you don’t need an education. Experience is more highly desired. These jobs are listed in a variety of job spots, but the ideal place to start would be Dice.com. Multimedia Artists/Editors – Especially video and animation production and editing. Getting paid for writing has become more competitve and unfortunately, prices have dropped, but there are some forms of writing that continue to pay well. Other great places to look for writing work, particularly higher paying work, are MediaBistro, FlexJobs and Indeed Jobs. Other sites like ProBlogger list writing work, but most don’t reach near the six-figure pay mark. Blogging – I love blogging because it’s completely flexible and I write about whatever I want. However, success in blogging requires planning and work. Most bloggers don’t make hardly anything at all. There are many who make $1,000 to $5,000 per month, and some who earn six-figures. Authorship – Writing books has the potential to pay well, but it’s one of the harder ways to make a lot of money from home. Success in books requires not only great books, but the ability to market your books and sustain sales.